Every now and then, a children's title crosses the desk and we find ourselves smitten. They open us up to wonder again. And this one speaks to us particularly, because it is about the love of reading. 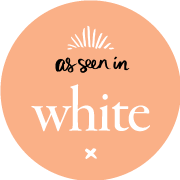 Justine Clarke is a well-known children's entertainer – the J.K. Rowling to the toddler crowd, if you like – and this is her debut children's book, co-authored with Arthur Baysting and illustrated by Tom Jellett. Within it we find a little girl who encounters a gobbledygook eating up books. But as he soon learns, books are not for eating but for reading, and they can take you on wonderful adventures, to Mars amogst the faraway stars, to places with dinosaurs with toothy jaws and giant roars, to the icy poles where the penguins live, and fairytale lands with ponies, wizards and queens. "I'm so excited about my first picture book," said Clarke. "The Gobbledygook is a little ode to the wonder and joy books provide and to the respect that brings for the object themselves – the books! I love reading to my kids before bedtime, it's the best part of my day. To open a book and read together is an active pursuit – that last great adventure to share before sleep descends; the launching pad to dreamland." This is a lively, frollicking book full of fun language to whet kids' appetites for reading and words, and, at the last, sleeping – with a monster by one's side, nonetheless, a message that will warm the parents of child frightened by things that creep and peep out from cupboards and from under beds in the night. The Crayola-esuqe illustrations with their bold, primary colours set the scene for a brilliant spring-time read. Clarke, Baysting and Jellett have done a commendable job in this book for pre-schoolers which hits stands just in time for Clarke's "Pop-Up Tour 2012". 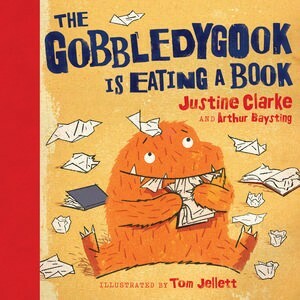 The Gobbledygook is Eating a Book by Justine Clarke, $19.99, Penguin, is out October 24.